Its been a month and all I had was trouble from day 2. I say day 2 because when it was installed I did a speed test in front of the installers and I got 45/19.... Which is what I expected. What more could I want. And so the installers left. The next day the speed was slower and the next day slower and slower and slower in small increments. Now about a month later I have approx 4Mbps download...? Where did the other 40Mbps go...? I called many times and chatted online many times and got the run around script talk each time. We need to do a line check,,, We need to reset your line,,, Turn your modem off/on,,, Disconnect and connect your modem,,, Disconnect all other devices,,, Hard reset your modem,,, Change the channel of the modem,,, blah blah blah. You get it..
Each time I call I have to do the same routine which ends with " Lets see how that goes, call us back if things dont improve"
Well they dont improve, they are getting worse. I am paying for a service that is NOT what was promised. Look, I do understand about "congested". This just mean Optus oversold their product and I have to suffer for it. But my problem is NOT congestion and one of the support people agreed with me as it cannot be congestion at 2am or 3am or 5am in the morning. Now I am getting 4Mbps on average at OFF PEAK times, sometimes it peaks up higher but only for a short time and then back down to Old ADSL speeds. I keep getting the run around by support. I was told to do regular speed checks and that I would get a phone call to see what can be done with my HFC problem but I got NO phone call. When I talk to support I get told its congestion even though I was told it is NOT Congestion. Optus, I am paying for a service that I am not getting. I do not have a "Congestion" problem at 4am in the morning...???? 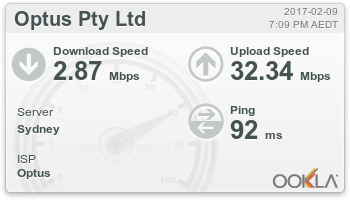 I have the latest technology but my internet is ADSL speeds or worse????? Optus ,,, you too can help me by actually looking into this issue and giving me an honest response and not the usual run around. It's disappointing to hear that you've had so many issues with the internet @Erict, I get that it'd be incredibly frustrating and it's something we can look into from here for you, if you can PM me with your account number or username, as well as your full name and DOB, we'd be more than happy to investigate. After a few Private messages I was told there is nothing they can do. I will have Congestion 23 hours a day and only between 4am and 5am will speeds be better. That's my 100/ 40 ATM. YEP, thats what I get 23 hrs a day ...... So they told me they cannot do anything and I can leave without penalty. The amazing part is they have over sold this product and now we the customers are suffering for it. Hi @Erict, really sorry for the inconvenience caused. I've checked your account and can see your internet speed concerns were discussed in details and different options were discussed as well. Hi @jasko_au, have you been dialling the 131344 number as that will get you through to our Tech Support team? They can run through some troubleshooting with you to help identify what's causing this. I went through the standard script. How bad are your Engineers that the systems is designed so badly OR the more likely, Optus who is OVER selling it its service. This is a bad move by Optus. You guys know exactly what the problem is, a lot of customers are having the same problems. Speeds that are ADSL level or worse. All we want as customers is a reasonable service for a reasonable price and this is something Optus has forgotten in its quick action to grab as much money as possible. The system cannot handle the present number of customers and yet you still are migrating new customers every day. What is going to happen in 6 months time....? Disappointing behavour by such a large company. And the solution given is "Sorry nothing we can do, It is congestion 23hrs a day" "You can leave without penalty"